Have you ever read something and felt immensely encouraged and convicted at the same time? That’s what Celebration of Disciple by Richard Foster is doing to me. Literally every chapter has been amazing and felt like slamming into a brick wall at the same time. It is like finally getting solid food after years of formula (this is my third time reading the book). Chapter 6 is on Simplicity. He says, “The person who does not seek first the kingdom [of God] does not seek it at all.” It must be first. Don’t fast first, don’t pray first, don’t read first. Seek God’s kingdom first. Otherwise, the other things can easily become an idol. Not just money, the job, but spiritual things as well. I can pray for the sake of praying, read for the sake of reading, and on and on. As I reflect on these past ten years of following Jesus for real, I must confess that somewhere seeking the Kingdom of God became second for me. Not sure how or where. I just started seeking the kingdom of myself and not the kingdom of God. Foster goes on to to say, based on Matthew 6, the presence of anxiety is evidence that we are not seeking first the kingdom of God. The things that make me anxious (family, money, job, rushing, etc. ), I don’t think I seek first the kingdom. For if I did, these important things would not be idols in my life. 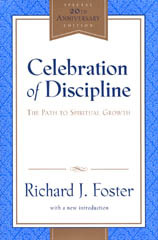 For 2012, I making a commitment to take one of the 12 disciplines in Celebration of Discipline each month and simply follow Jesus. Final quote from Foster: We must wake up and realize conformity to a sick society makes one sick. Even in following Jesus, I don’t think I have been following Him in the manner He calls me to.